A new feature to the Pokemon series, starting with Pokemon X and Y versions is 'mega evolutions'. Unlike normal evolutions, mega evolutions occur only within battles to boost battle stats. When the battle is over the Pokemon will return to normal. In order to get a Pokemon to mega evolve the Pokemon must be holding an item specific to that species and while in a battle a button is selected before selecting the move. These Mega Evolutions were announced before the release of Pokemon X & Y.
Mega Venusaur was revealed in Pokemon Direct on September 4th, 2013. Mega Venusaur has the ability 'Thick Fat'. Mega Charizard X is (as the name implies) exclusive to Pokemon X. It was revealed during the airing of the anime special "Pokemon Origins". Mega Charizard was revealed in Pokemon Direct on September 4th, 2013. 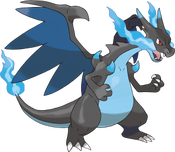 Mega Charizard has the ability 'Drought'. It was later revealed that this mega evolution was exclusive to Pokemon Y.
Mega Blastoise was revealed in Pokemon Direct on September 4th, 2013. 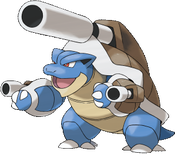 Mega Blastoise has the ability 'Mega Launcher'. 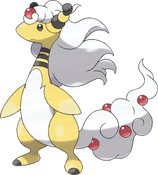 Mega Ampharos was revealed in the August 2013 issue of CoroCoro. Mega Ampharos has the ability 'Mold Breaker'. Mega Absol was revealed in the August 2013 issue of CoroCoro. Mega Absol has the ability 'Magic Bounce'. 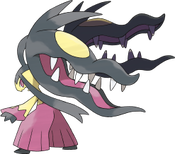 Mega Mawile was revealed in the August 2013 issue of CoroCoro. Mega Mawile has the ability 'Huge Power'. This form was revealed in the October 2013 CoroCoro magazine. This form is exclusive to Pokemon X and requires 'Mewtwonite X' to mega evolve. It has an increased attack stat. A leak from CoroCoro magazine has shown a possible new Mewtwo form/evolution alongside Genesect. This form/evolution was confirmed in the April 7th Pokemon Smash episode. It has since been released that this form is Mewtwo's Mega Evolution. Mega Mewtwo has the ability 'Insomnia'. Mewtwonite Y is required to Mega Evolve. Mega Lucario was revealed in the August 2013 CoroCoro magazine. Lucarionite is required to transform Lucario into Mega Lucario. Mega Lucario has the ability 'Adaptability'. 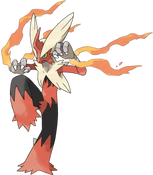 Mega Blaziken was revealed in the August 2013 issue of CoroCoro. Blazikenite is required to transform Blaziken into Mega Blaziken. Mega Blaziken has the ability 'Speed Boost'. Mega Kangaskhan was shown at the Video Game Championships in Vancouver in August 2013. The baby Kangaskhan can be used to battle thus giving Mega Kangaskhan two attacks in one turn. This form was revealed in the October 2013 CoroCoro magazine. The speed stat will decrease but the attack and special attack stats will get an increase.